Pine Crest Elementary School opened in 1955 at 405 West 27th Street in Sanford. The school was built in order to accommodate the growing population of baby-boomers that led to overcrowding at Southside Elementary and Westside Grammar Elementary School. Margaret Reynolds, daughter of the owners of Kader's Jewelry store on Park Avenue, was the school's first principal. Several of the teachers and staff at Southside, including Reynolds, transferred to Pine Crest when it opened. Original payroll report, 1955: Sanford Grammar Collection, Archives Box 4B, UCF Public History Center, Sanford, Florida. 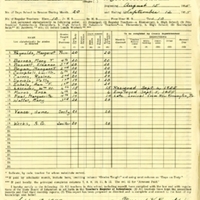 Digital reproduction of original payroll report, 1955. "Pine Crest Is The School Of Innovation." Pine Crest Elementary School, Seminole County Public Schools. http://www.pinecrest.scps.k12.fl.us/Home/QuickLinks/AboutPineCrestElementary.aspx. Reynolds, Margaret. “Pine Crest Elementary School Principal's Monthly Payroll Report, August 15, 1955-September 12, 1955.” RICHES of Central Florida accessed April 20, 2019, https://richesmi.cah.ucf.edu/omeka/items/show/4715.